Neither flashy nor rare, spicebush is a stalwart plant of wetlands with intricate minute flowers, enchanting fragrance, and modest horticultural potential. The yellow haze of spicebush flowers is a certain harbinger of spring. Spicebush is a multistemmed deciduous shrub that grows to a height of one to three meters. Young stems are delicate and may be smooth or finely hairy. Leaves are alternate and simple, with an elliptic to obovate blade that tapers at both the base and apex and is bounded by a smooth margin. Examined closely, the margin will reveal a series of fine hairs that project directly out from the leaf edge. In size, leaves are neither remarkably large nor small; they range from one to six inches in length and up to about two and a half inches wide, the widest point somewhat above the middle of the blade. Overall, leaves offer few distinctive features for easy visual recognition. However, as the common name implies, a pleasant fragrance emanating from crushed stems or leaves provides a reliable cue for identification of this common but easily overlooked plant. Spicebush flowers in the early spring well before emergence of its leaves. The plants are usually dioecious, which means that staminate (male) and pistillate (female) flowers occur on separate individuals. Staminate and pistillate plants can be distinguished before flowering by the number of flower buds attached at the nodes of young twigs: the staminate buds are decidedly more numerous. 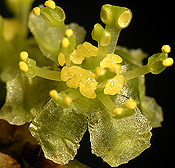 In full bloom, the staminate and pistillate flowers are quite small, about 5 mm in length and diameter, yellow, and nearly sessile on the bare twigs. Flowers of both sexes are enclosed in a sixmembered perianth; distinguishing these similar perianth elements as either sepals or petals is problematic. Staminate flowers have 9 fertile stamens which, despite their small size are intricately structured. As is characteristic of the family Lauraceae, anther stalks bear a pair of glands and the anthers open by means of little flaps resembling trapdoors. Pistillate flowers have a single simple pistil (ovary, style, and stigma) and a variable number of sterile stamens called staminodia. Over the course of the growing season, the simple pistil will mature as a shortstalked fleshy red fruit about a half inch long and containing a single seed. Fruits mature by late summer or early autumn, not long before the leaves drop. The genus name for spicebush commemorates Swedish Botanist John Lindler. “Benzoin” refers to an aromatic resin derived from an unrelated plant, a species of Styrax from southeast Asia. Nevertheless, spicebush was once classified in a genus called Benzoin, but this nomenclature is now considered archaic. Lindera is classified in the laurel family, or Lauraceae. As such, it is related to our local sassafras (Sassafras albidum) and several exotics frequently encountered in supermarkets: the avocado (Persea americana) of central America, bay leaf (Laurus nobilis) from the Mediterranean, and cinnamon (Cinnamomum spp.) from southeast Asia. Spicebush has two close relatives from the Atlantic and Gulf coastal plain: Lindera melissifolia and Lindera subcoriacea, both of which are plants of some conservation concern. As is typical of many members of Lauraceae, tissues of spicebush are permeated with deposits of terpenes and related fragrant compounds, sometimes called, generically, “essential oils.” Bark, twigs, leaves, and berries have all been used to prepare flavorings or folk medicines based on these fragrant compounds. Ground fruits, fresh or dried, with or without the single seed, have been used as a substitute for allspice. Fruit oils have also been used as a liniment for sore muscles and joints. Otherwise, most spicebush folk medicine employs tealike preparations to treat a wide variety of ailments. No claims are made here regarding efficacy. Despite traditional use and little or no evidence of toxicity, longterm and high dosage effects of spicebush ingestion are unknown so caution would seem prudent. “facultative wetland” species in formal determinations of wetland habitat. In nature, it often forms dense thickets that provide excellent cover for small mammals. readily consumed by various frugivorous birds. In the garden spicebush is a useful component of naturalistic plantings at the edges of lakes or ponds or in other areas where excessive soil moisture limits plant choices. It will thrive in full sun or part shade and has potential value in erosion control. When viewed from a distance, flowering plants provide a subtle haze of yellow color much appreciated for its appearance in early spring. The floral display will be enhanced if the sightline has the bushes aligned with a dark backdrop. For best effect, the planting should include both staminate and pistillate individuals. Staminate plants are, perhaps a bit showier in flower, but only the pistillate plants produce the bright glossy red drupes which can be very attractive when viewed closeup, as from a lakeside path. Plants of both sexes offer bright yellow foliage in the fall especially on specimens planted in full sun. Also, spicebush will attract both butterflies and birds to the garden (see ecology). Spicebush can be propagated by seed or softwood cuttings. The seeds must not be allowed to dry out. For best germination, freshly collected seeds should be stratified at 40 F for at least four months before being sown. The plants are vigorous and suffer little in the way of diseases. Spicebush is widely distributed in the eastern United States, from New England south to Georgia and eastern Texas, and west to Michigan and Missouri. This area spans hardiness zones 4 through 9. Spicebush has been documented to occur in every county in Virginia. Depending on elevation and the vagaries of spring’s arrival, spicebush can usually be found in flower in Virginia sometime in the month of March. Berries ripen in September. Spicebush is a common plant with no particular or special threats to its continued existence in the wild. However, as with all native plants, the indiscriminate onslaught of habitat alteration and outright habitat destruction impacts the health and vigor of local populations. Also, the continued existence of the spicebush swallowtail butterfly depends on spicebush and close relatives such as sassafras and redbay (Persea borbonia), since its larvae eat no other plants. Gardeners should not collect spicebush in the wild and should be certain that all native plants purchased for home gardens are nursery propagated, not wildcollected. For a list of retail sources of nursery propagated plants, see elsewhere on this Web site. Text from 2006 Virginia Wildflower of the Year brochure, written by W. John Hayden and adapted by him for the Web, January 19 2006.